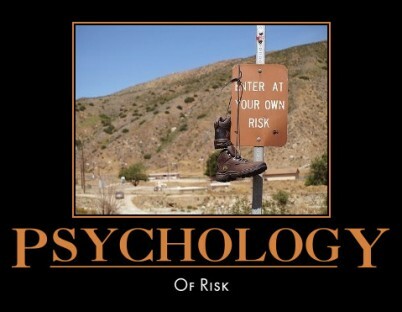 The psychology of risk has been subject to detailed study which has addressed a number of conceptual issues relating to risk perception, behavior and decision making; and this fascinating research has sought to examine these issues from within a number of diverse theoretical perspectives. You can access this great resource by Clicking Here. Recently published study from Daniel Kruger et al from The University of Michigan refuting standard theories of risk which group people as either risk-seeking or risk-avoiding, suggesting in contrast that individuals can exhibit a mix of both risky and non-risky behavior. Click Here to access a full text PDF file of this research paper. Very interesting Psychology Today article written by Maia Szalavitz, addressing the fact that we are basically terrible at assessing modern risks. You can read this engaging article in full by Clicking Here. Risk surrounds and envelopes us. Without understanding it, we risk everything and without capitalising on it, we gain nothing. 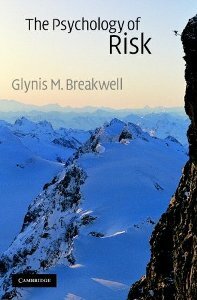 This accessible new book from Glynis M. Breakwell comprehensively explores the psychology of risk, examining how individuals think, feel and act, as well as considering the institutional and societal assessments, rhetorics and reactions about risk. Featuring chapters on all the major issues including risk assessment, hazard perception, decision-making, risk and crisis management, risk and emotion, risk communication, safety cultures, the social amplification and social representation of risk and mechanisms for changing risk responses, Breakwell uses illustrations and examples to bring to life the significance of her research findings. She provides an innovative overview of current knowledge on the subject but also suggests that there are many fascinating questions still to be answered.